Back in 2004, we started hearing the words “Living Room Convergence.” This was a marvelous idea that one day all of our data would be easily accessible through a computer, Laptop, etc. This would replace our pile of DVDs and CDs along with our cable boxes and home phone service. As the words started dying out, the reality began to hit us. Here, in 2011, we have certainly hit the critical “Living Room Convergence.” Let’s take a tour of this phenomenon, shall we? Over the last few years, we have seen a proliferation of things going wireless, from phones to computers and even our digital displays. More and more of our lives are hosted “in the cloud” than ever before. 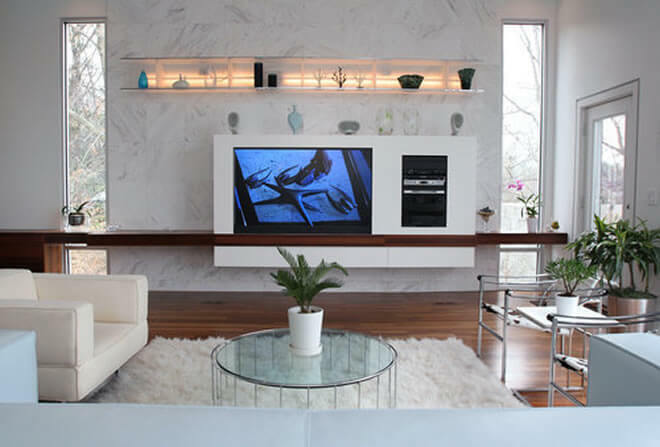 What this brings us is the ability to have all of our media and computing needs met with a minimum of wires stringing along our homes, turning our living spaces back into beautiful designs with fewer tripping hazards. Our video game consoles also offer wireless connections, now. This means that we can access downloadable content for our games as well as having streaming devices for video services, such as Netflix. Never before in our lives have we known such understated arrangements when our electronic devices were installed. In 2010, those geeks who knew the pains of standing beside their HDMI screens and awkwardly handling laptop, cords and managing to advance through photographs stored on that laptop from their latest vacation, have finally received the answer to their prayers. WiDi allows the user to connect their HDMI television or monitor to a small box that is much like a router and experience the web on their television sets! No 30 foot cables stringing across the room; just a wireless signal that brings the presentation to your choice of living room TV. Of course, you must have a laptop that is compatible and you must have the device itself. Any laptop with the Intel Core i7 models or higher will do the trick. Netgear has cornered the market on WiDi boxes for home use, and one can be had easily through their website. This technology has truly revolutionized how we see home computing and entertainment. Thanks to the development of streaming system replay devices like the Roku, Apple TV and the WD TV Live Plus, users with subscriptions to Netflix, BlockBuster, iTunes and other streaming video sites as well as YouTube users, can stream their favorite movies and TV shows directly to their Television sets. This adds to the truth of the living room convergence by bringing us services that once were the sole function of our computers. Some features of these devices include being able to listen to Pandora music stations as well as viewing YouTube videos from your TV. Many of these devices also allow themselves to be hooked up to external hard drives so that movies that may be stored there can also be played. Music and photographs can also be shared through the set top box. In most cases, the boxes weigh slightly less than a pound and are smaller than a paperback novel, making sure that they are smooth and classy, fitting in with your television and not looking at all clunky. RELATED: Linux Web Hosting – What Makes it Click? Slightly larger than your cell phone, and only a little heavier, the tablet computer has become one of those items that “all the cool kids have”, so to speak. The iPad has become the ultimate in portable computing, as well as in business management connecting to cloud services in order to maximize the availability of applications while saving much coveted hard drive space. Thanks to the larger screen, movies, television shows, books, music and photographs and any other form of media you can imagine, can be easily shared. Of course, the iPad also makes available games and other forms of entertainment while working side by side with your business applications, offering a well-rounded and well-developed option for the consumer on the go. Last, but certainly not least…and definitely taking it one big step further, is the concept of home automation. So, you have your media center based in your living room and you can control everything there with either your laptop, phone or tablet computer. What about the rest of your home? Of course, there are places that will allow you to wire your home entirely so that you can control everything, from the lights to your air conditioner and home alarm system (with all this technology in there, you have one, right?) through your mobile phone or through your laptop. It can even be set up that there are cameras within your home that you can operate and look in on through a secure website giving you the peace of mind that your home is safe while you are away. There are many people who have found this type of home automation to be of great benefit, and it is one more step on the ladder to becoming technology-ruled people. The ease of turning those lights off in your living room so that you may save energy through your laptop has proven to be essential to some people. Automation is very popular with high level executives who are single and who choose to not place an assistant who remains at home to help them in keeping track of such things. It seems that, the further along the way we go, the more automated and more technology that becomes involved with our lives. Some people feel that this is a good thing and others are frightened of it. Some fear for our children becoming addicted to new technology and not being able to live without it. Some people just fear technology, period. As with all things, a manner of moderation will do you the best when dealing with our ever increasing world of tech. Take it slowly and learn about your options, and only use which technology you want to use and are comfortable with. As always, enjoy yourself!